In the last few weeks, financial markets have been rocked by the drop in oil prices, and in the process reminded us of three realities. The first is that for all the money that is spent on commodity price forecasting, there is very little that we have to show for it. The second is that all large macroeconomic events create winners and losers and the net effect of this oil price change, whether positive, neutral or negative, may take a while to manifest itself. The third is that investors are generally ill-served by either panicky selling of all things oil-related or the mindless buying of the most beaten-up oil stocks. While much of the attention has been directed at the 40% drop in oil prices, the tripling in implied volatility in oil prices is a worth paying attention to and as I will argue later, could have an effect on not just oil stocks but on the overall market. The initial stories about the oil price shock were almost all positive, suggesting that lower gas prices would allow consumers to spend more money on retail, restaurants and other businesses, thus boosting the economy. In the first two weeks of December, though, there was an abrupt shift in mood, as the same journalists who were lauding the oil price drop a few weeks ago were pointing their fingers at it as the primary culprit behind worldwide stock price declines in those weeks. The most sobering aspect of the oil price collapse is that is truly came out of nowhere, with none of the economic forecasters at the start of 2014 predicting the magnitude of the drop. In early 2014, Bloomberg's survey of the "most accurate" oil price forecasters yielded a forecast of $105 for oil prices for the year, illustrating that "accurate" is a relative term in this market. In a Reuter's poll in December 2013, which surveyed analysts about oil prices in 2014, the lowest price forecast was $75 by Ed Morse, Gobal Head of Commodities Research at Citibank and a longtime bear on oil prices. If you believe that oil companies, being closer to the action, were prescient, you would be wrong. Early in 2014, Chevron announced that its budgeting would be based upon oil prices of $110/barrel, with John Watson, the company’s CEO, stating, “There is a new reality in our business… $100/bbl is becoming the new $20/bbl in our business… costs have caught up to revenues for many classes of projects.” and adding that, “If $100 is the new $20, consumers will pay more for oil.” Chevron was not alone in this assessment and oil companies globally made investment, acquisition and production decisions based upon the assumption that triple-digit oil prices were here to stay, which explains why at a $60 oil price or lower, almost a trillion dollars in investments made by oil companies were no longer viable. Looking at airlines, where fuel costs represent a large proportion of operating expenses, there is evidence that fuel hedging follows the oil price, rather than leading it. Fuel hedging peaked in 2008, just as oil prices peaked, and have tracked oil prices down in the years since. Completing the clueless trifecta, investors have also been behind the curve on oil prices. Institutional money continued to flow into oil stocks for most of the year and flowed out only in the last quarter as oil stocks tumbled. The so-called smart money did worse, with hedge funds among the biggest losers in oil stocks, with big names like Icahn and Paulson leading the way with big money-losing bets. If there is any good news for oil price bulls, it is that oil forecasters are now predicting lower oil prices next year, oil companies are reassessing their assumptions about a normal oil price, airlines are reducing or even suspending their hedging and institutional investors are fleeing from oil stocks. 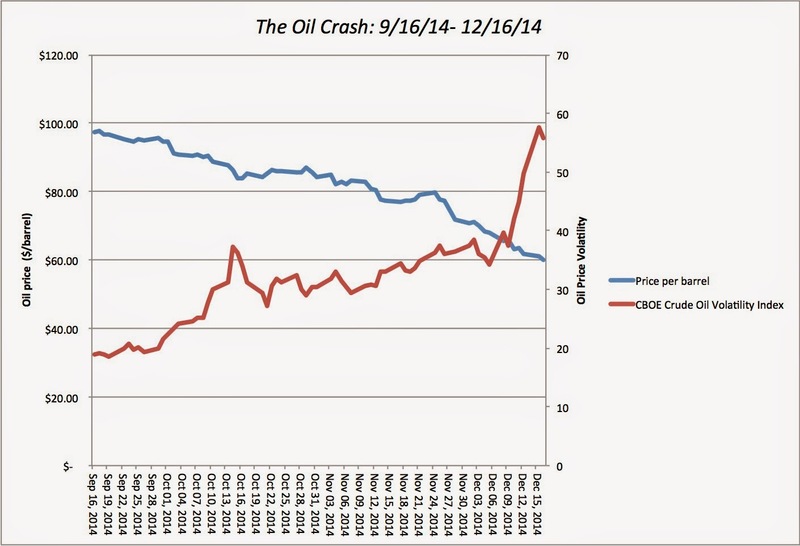 Given their collective track record, this may be the best time to bet on rising oil prices. When oil prices drop, the most immediate impact is on oil producers and the ecosystem that serves them, including equipment and service providers. Within this group, though, the effect can vary depending on geography, size and leverage, as we will see in the nest section. The effect of an oil price change on a oil producing company may seem obvious, but it goes beyond the effect on revenues and earnings in the near term. By changing the payoff to growth and the risk in the company, a change in oil price can have a multiplier effect on value. 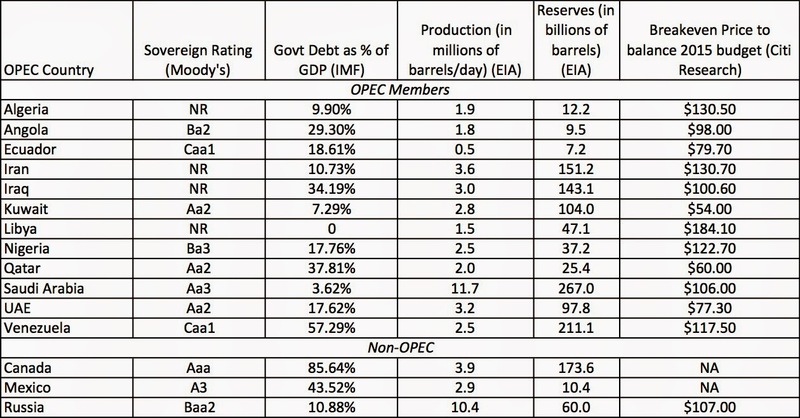 With these effects in place, you should expect the most negative effects of declining oil prices to be at highly levered oil companies with costlier reserves and higher fixed costs. 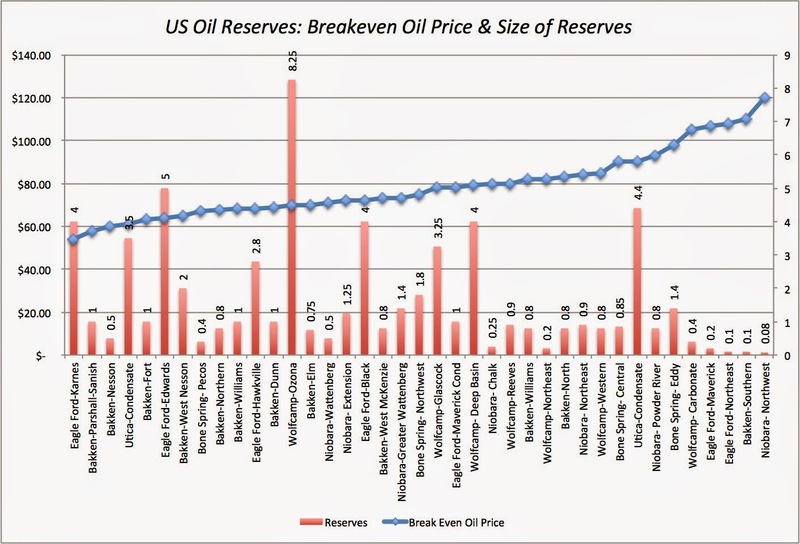 I would take the breakeven prices that analysts report for reserves with a grain of salt, because computing a true breakeven would require significantly more information about sunk versus incremental as well as fixed versus variable costs of product than we have access to, but the fundamental truth remains. As oil prices drop, the effect on value and viability will vary across reserves and that effect should then percolate through to companies. 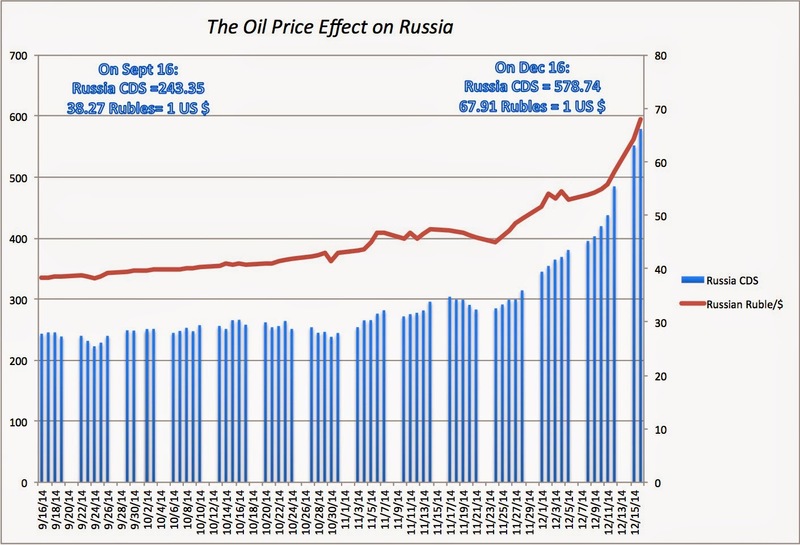 Between September 16 and December 16, as oil prices retreated, the most vulnerable country (partly because of its dependence on oil for revenues and partly because of geopolitical events) has been Russia. In the graph below, we capture the carnage in changes in the sovereign CDS spread for Russia (a measure of default risk in the country) and in the Russian Ruble. 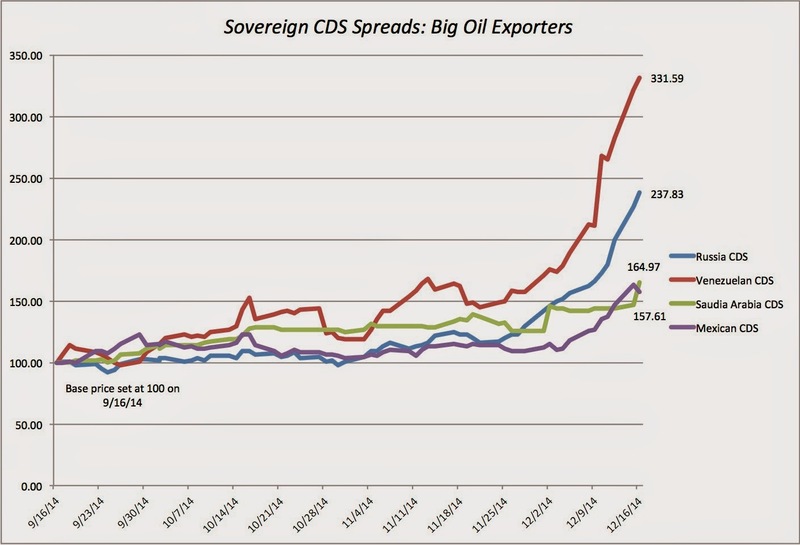 Looking more broadly, it is clear that the damage is not limited to Russia, as evidenced in this graph of sovereign CDS spreads for four oil exporting countries: Russia, Venezuela, Saudi Arabia and Mexico (with the September 16 CDS price being set at 100 for all four). The damage has been greatest in Russia and Venezuela, with the Russian CDS increasing 137.83% and the Venezuelan CDS more than tripling. However, Saudi Arabia and Mexico, though in much better shape, have also been affected with the Mexican CDS increasing about 58% and the Saudi CDS increasing 65%. As with the oil sector, the extent of the damage varies across sub-groups, greater for the ten largest solar companies than it is for companies across the solar energy chain or more broadly in clean energy. Consistent with the behavior of returns across stocks across ratings classes, investment grade energy bonds were much less affected than below investment grade bonds. The winners from lower oil prices are harder to find, at least in the short term. You would expect that companies that have a high proportion of their costs connected to oil prices to gain the most, and the two sectors that were mentioned as beneficiaries were the airlines and trucking companies. The airlines were the biggest gainers, but note that the collective market value added (about $55 billion across all companies in the sector, globally) was dwarfed by the losses of more than $2 trillion in oil and green energy companies. Between 1974 and 2013, there is little evidence that lower oil prices (in either dollar or percentage terms) have had any effect on economic growth (real GDP), interest & inflation rates or stock prices. In fact, the only variable where there is a relationship is with the US dollar, and lower oil prices have led to a weakening of the currency historically. 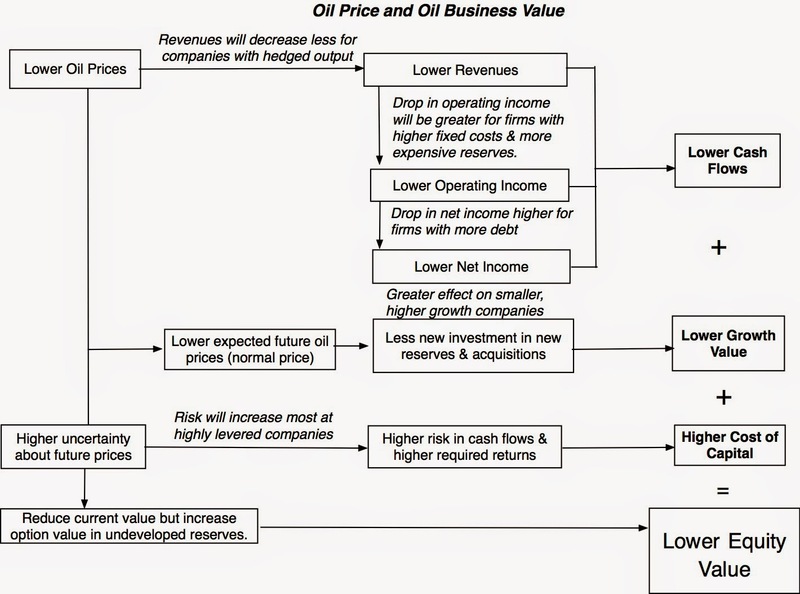 Looking at the trade off, there are two key benefits that come from lower oil prices. The first is that consumers will be spending less on oil (for transportation and heating) and will thus have more money to spend on retail, leisure and other consumer discretionary items. The second is that lower oil prices will reduce inflation, at least in the near term, thus giving central banks a little more wiggle room in monetary policy. There are, however, two potential costs. The first is that with a large enough oil price drop, the financial distress at oil companies and oil exporting countries may spread into the rest of the economy; defaults by large oil companies or a large sovereign borrower can create chaos in the financial markets. The second is that oil prices in free fall are often accompanied by higher uncertainty about future oil prices, as has been the case in the last few weeks, which, in turn, can lead to more uncertainty about overall economic growth, interest rates and inflation. Since these are drivers of the overall equity risk premium, a higher equity risk premium and lower stock prices will ensue. It is true, that the oil price drop in the last few weeks, has been large, relative to history, and that the effects may therefore be different, but that may be one more reason not to wait and see what the macroeconomic effects of these prices will be. You may not be a market timer or oil price forecaster but oil prices do have an effect on your portfolio and perhaps on your investment strategy. As you look at the damage created by plunging oil prices, at least to the oil in your portfolio, it is easy to second guess decisions that you made weeks, months or even years ago. I believe that regret and navel gazing is not only pointless but dangerous and that your time will be better spent picking up the pieces and looking forward. Generically, there are four viewpoints that you can have on oil prices: that they will continue to decline (the momentum story), that $60 is the new normal price ($60 is the new $100), that they have fallen too far and will bounce back (the contrarian play) or that any of the above (price agnostic). Within each viewpoint about oil, you can either go for a protective strategy or an aggressive one, with the latter becoming more attractive as your confidence in your viewpoint increases. You can put me firmly in the "price agnostic" category. The oil price exposure that I have in my portfolios reflects investments that I have made over time in stocks that I perceived as good value at the time that I made them and were not designed primarily to increase my oil price exposure. If I choose to sell them, it will be because I don't view them as good value, given oil prices at the time of the assessment, any more and not because I have a point of view on oil prices. Thus, my Lukoil investment from about four weeks ago, when oil prices were $77/barrel, is down about 15%, but given today's oil price, it is under valued today. My investment timing clearly left much to be desired but selling it today will not get me my money back! Up, up and away! A crowd-valuation of Uber! In June 2014, I tried to value Uber and arrived at an estimated value for the firm of $6 billion, an impressive number for a young firm, but well below the VC estimates of value of $17-$18 billion at the time of my post. Much of the reaction was predictable, with readers whose priors were confirmed by my assessment of value liking it and those whose priors were different disagreeing,and sometimes vehemently. Disagreement and debate don't bother me in the least, since they can only advance the valuation narrative, but I do think that putting my narrative and valuation front and center undercut my objective in two ways. First, it made for passive analysis, where you could pick and choose which one of my valuation inputs you agreed with and which ones that you found erroneous, the justifying your prior biases. Second, some who disagreed took the easy way out, arguing that it was my use of an intrinsic value (DCF) model that had led me down the wrong path and that it was therefore unfixable. Now that Uber is in the news again, with value estimates of $40 billion and higher floating around, I decided to revisit the valuation, but from a different angle. Rather than presenting my valuation, I want to open the process up and I would like to invite you along for the journey. Like a book or movie where you get to write not just the ending but the entire story, I will provide the architecture and you can build your own valuation story (and value) for Uber. The good news is that this valuation will reflect your views (not mine) on Uber. The bad news is that if you don't like the value, you cannot blame me. While my original valuation of Uber was all about the numbers, I followed it up with a post where I argued that if you disagreed with my value, it was not because you had a problem with my estimates (of growth or risk) but because you were taking issue with my narrative. Underlying my original valuation was a story that I was telling about Uber as an urban cab/limo service company that would continue to attract new users into the market, while maintaining its high profit margins. In response to a post by Bill Gurley, venture capitalist investor (and director) in Uber, where I was accused of missing the story by a mile, I conceded that I knew far less than he did about the company and that his narrative for the company - Uber as a car-service for the masses with global networking benefits - would lead to a much higher value for the company. This is your valuation: Contrary to what you might have been taught in your valuation classes, valuations are and should never be just about the numbers. To the extent that you will be making choices on these number, this will be your estimate of valuation, reflecting not only what you know about the company (and its products, management etc.) but also your personal biases (whether you like the company or not). You are almost certainly wrong: Lest you view this is an insult, so is my assessment of value and so are the VC’s valuations. It is not because we don't understand valuation or have not done our homework, it is because we are trying to play God and forecast the future. You should be open to revisiting it: Following up on the last proposition, it stands to reason that the choices you make in valuing Uber today will not be the choices that you will make tomorrow or a week from now. So, keep the door open for changes not just at the margins but in your central narrative. Be willing to act on it: There is no point to valuing companies, if you are not willing to act on your valuations. With Uber, it is true that you and I are restricted in what we can do, since the company is still private. However, it is also clear that the explosive growth in the estimated value of the company sets it on a path to being public (sooner, rather than later), at which point our valuations will become actionable. The first step in valuation is assessing where the company is right now and we start off at a disadvantage, because it is amazing how little we know about the operating details of a company that is in the news as much as Uber. According to the company's website, it operates in 51 countries and in about 230 cities on six continents, and it has also expanded its product offerings, both within the car service market (with U4B, directed at businesses and UberPool, allowing for car pooling)and in new markets (with UberRUSH, its delivery service in New York City). The only updated revenue numbers came from an article in Business Insider, which seems to be one the company's preferred venues for leaking selective information. According to the article, the company projects gross receipts of $10 billion in 2015, up three times from gross receipts in 2014, which in turn more than tripled relative to receipts in 2013. While the company originally kept 20% of these receipts as revenues, it is unclear whether that number has slipped in recent months, as it has gone aggressively for new growth. While I am normally loath to value companies based upon second-hand information, and especially so if the information comes from a leaked corporate document, I am going to assume that the company will generate $3.5 billion in gross receipts for 2014 and that its slice has stayed at 20%, giving it revenues of $700 million for the year. I have no idea whether it is profitable after covering its operating costs, but the impact on the final value of these initial numbers is small enough that it is worth moving forward. There are thus six steps to the narrative process and your choices at each step will determine the numbers from which we estimate value. The potential starting market can range from $100 billion (for urban car service) to close to $300 billion (if you treat it as transportation company, going after all of the markets above). Since this is your narrative, its your choice to make and it will have significant value consequences. Based on what you know (and think about) Uber, which of the following do you think is its potential market? Uber is not only disrupting the existing players in the market that it disrupts but it is also attracting new users into the market, either by attractive non-cab users to try Uber or increasing the usage of car services, in general. Assuming that this process continues, the growth rates in these markets could increase if Uber's services (or Uber-like services) become more widely accessible. Here again, the choice is yours. Based on the potential market(s) you chose for Uber in step 1, what effect do you see Uber (and Uber-like services) having on the expected growth rate in the market? Having chosen a potential market and a growth rate in that market, the third step is making a judgment on what market share you would expect Uber to command once the market hits steady stay (in ten years). That choice will depend in large part on whether you think Uber's products/services have network effects, where increased usage of Uber by customers in a market makes it more attractive to other potential customers, and whether you think these network effects are local (in the city/region of usage) or global (in other cities/regions). The arguments for local network effects are easy (the more Uber users there are, the more Uber cars there are, which in turn makes it easier/quicker to get an Uber ride) but the ones for global network benefits may be more of a stretch (links to credit cards, inertia, uniformity of service, staying with the known). Once you have assessed the pluses and minuses, here are your choices. 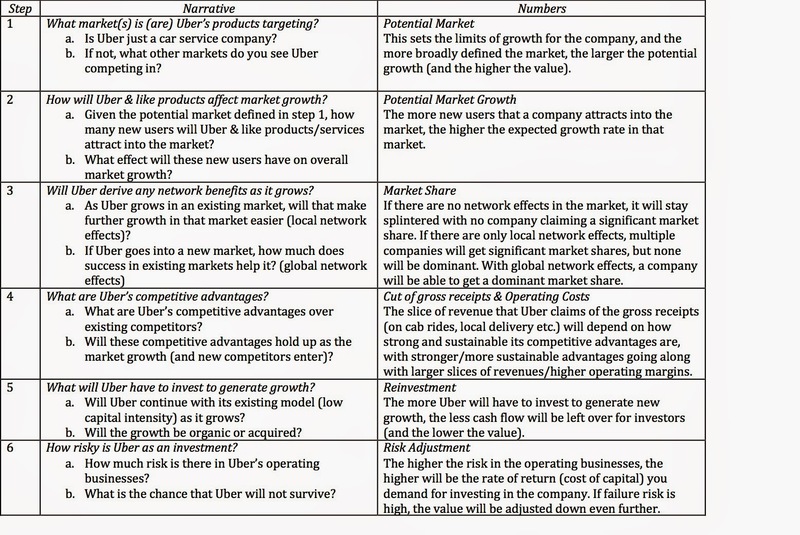 Based on your assessment of Uber, what type of network effect (if any) do you see for its products and services? Given the markets that you see Uber entering and the competition it faces within those markets, how strong and sustainable are Uber's competitive advantages? Uber's existing business model, where it acts as an intermediary and does not invest in cars or equipment, has low capital intensity and as a consequence, much of its growth has come with relatively low reinvestment. That could change, if Uber decides to change its business model or if it has to do acquisitions to continue to generate growth. Based on the business model that you see Uber adopting as it goes for the market share (that you forecast) in your potential market, which of the following reinvestment policies best fits the company? As I noted in the table above, there are types of risk that you have to grapple with in valuation. The first is the risk in operations, which causes revenues and earnings to be volatile over time, and that risk is captured in the risk-adjusted return you demand for investing in the company. In valuation, the cost of capital becomes the measure of this risk-adjusted return and is generally estimated by looking at publicly traded companies (even though Uber is privately held still). Rather than wrestle with the minutiae of inputs into the model, you can make a judgment on where in the cross-sectional distribution of costs of capital across all companies you would put Uber. Based on your assessment of the risk in the market that Uber is entering and where the company is in its life cycle, what cost of capital would you pick for the company? The other risk for a young company is survival risk, i.e., the risk that you are one disaster from shutting operations. That risk increases for smaller companies with small cash holdings, large cash needs and limited access to capital. Given Uber's capacity to raise capital and cash holdings, this risk should be lower. If your set of assumptions is not listed above, you can download the spreadsheet, enter your choices and see what the value of Uber is with those choices. If you don't like the value that you get with your narrative choices, I am afraid that it is just a reflection of your choices. Soaring narratives, soaring values: I know that some people view DCF models as inherently conservative and thus unsuited to valuing young companies with lots of potential. As you can see in the table above, if you have a soaring narrative of a huge market, a dominant market share and hefty profit margins, the model will deliver a value to match. Put differently, if you found my original valuation of Uber too low, the fault lies with me for having a cramped vision of what Uber can accomplish and not with the model. It also stands to reason that when you have big differences in value estimates, it is almost always because you have different narratives for a company, not because you have a disagreement on an input number. Not all narratives are made equal: While I have listed out multiple narratives, some of which deliver huge values and some not, not all are equal. Looking forward as investors, some narratives are more plausible than others and thus have better odds of succeeding. Looking back ten years from now, reality will have delivered its own story line for Uber and the narrative that came closest to that reality will be the winner. Narratives need reshaping: The narratives for Uber that you developed are based on what you know today. As events unfold, it is critical that you check your narrative against the facts and tweak, change or even replace the narrative if the facts require those adjustments, which was the point that I made in this post. Narratives matter: Success, when investing in young companies, comes from getting the narrative right, not the numbers. That may explain why some successful venture capitalists can get away being surprisingly sloppy with they numbers. 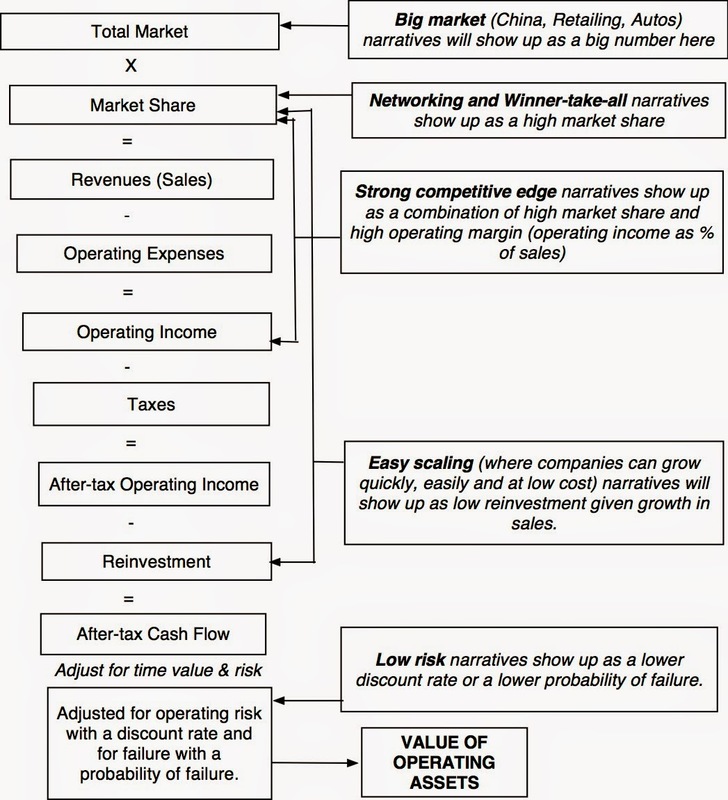 After all, if your skill set includes finding start-ups with strong narratives and picking founders/entrepreneurs who can deliver on those narratives, the fact that you cannot tell the difference between EBITDA and free cash flow or compute the cost of capital will be of little consequence. If you are waiting for me to reveal my narrative choices, you will be disappointed. This is your valuation, not mine, and I hope that you like it. If you could please go in and put your narrative choices and resulting value for Uber into this shared Google spreadsheet, we can get a crowd valuation of Uber!